“I am ashamed of how badly we use public funds and of the fact that in Europe the fundamental rights of the populations are so clearly ignored”. Shockingly, this was the conclusion of one of the MEPs on the European Parliament’s Transport Committee. Yup, that’s the outfit that has defined the HS2 corridor, captured in the EC TEN-T plans. But what brought on this ‘mea culpa’? In a historic decision this Tribunal declared that “the fundamental rights of citizens to information and participation were violated in contradiction of numerous international conventions”. They put the responsibility for this on “the development companies; the Governments and the European Union”. They made various recommendations including that there should be a suspension of the projects until there had been a meaningful consultation with people, extending to the examination of all possible options “without ruling out the zero option”. Now this ties in rather smartly with the case still being pursued by HS2AA in its appeal to the Aarhus Convention. 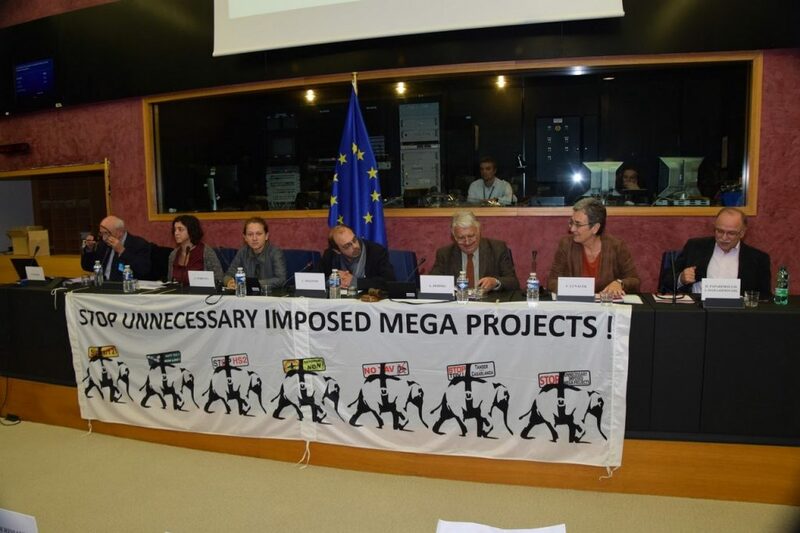 The PPT took evidence on HS2 as well as many other projects across Europe, and they all came together to present the Judgement to the European Parliament. It was an amazing day. 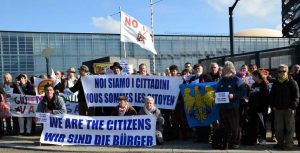 It started with a short demonstration outside the gates of the European Parliament, where we all held up placards declaring ‘we are the citizens’ in many languages, to make the point that we are entitled to enter the European Parliament and make our case. It had been a two-year struggle to get this meeting! Inside the Parliament about 150 activists and many MEPs witnessed the handing over of the Judgement to two Vice-Presidents of the European Parliament and then listened to about 16 speakers giving voice to the loss of civic and human rights in connection with mega projects across the EU. HS2 spoke as well. Although invited to the presentation of the Judgement of the PP Tribunal, Mr Ruijters, who heads up the TEN-T (transport plan) unit in the EC declined to attend or send a deputy. Would that be contempt for democracy, cowardice, arrogance or all three? Draw your own conclusions! You can read one report on the event by GUE/NGL, who hosted the organisation of the meeting. There is a video of the entire session on this page, with Mike Geddes of Stop HS2 speaking at 2:01:50. As well as noting the evidence on the lack of meaningful public involvement, the PP Tribunal hearing had paid attention to the specific effects of the criminalisation and militarisation strategies pursued by a number of Governments as the basis for pushing through their projects. What does this mean? Well here is one example: The Italian Government has declared that the tunnel through the Alps for the Lyon-Turin HSR is of ‘strategic’ importance for the State. Of course this is rubbish not least because they are systematically downgrading the existing services through the existing tunnel in order to create the demand for the new tunnel. However, the declaration of this status has allowed the Government to by-pass all normal planning processes, local government and local community involvement and to respond to any opposition with military means and with completely unbalanced civic repression. Thus there was also a contribution to the meeting via Skype from Nicoletta Dosio who is under ‘house arrest’ because of her opposition to the Lyon-Turin HSR. This is a ‘little old lady’ in her 70s and she is accused of being a major State terrorist. Similarly, we were told that there are currently 1,000 (yes, a thousand) legal actions being taken against activists in the Susa Valley alone, in which judges are required to hand out maximum sentences and which, given that ‘terrorist’ hearings have to take precedence, are completely tying up the whole Italian legal system instead of addressing real issues of criminality. 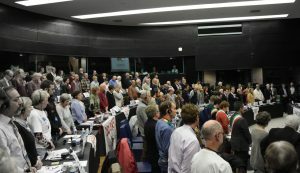 In other evidence the Tribunal heard about the violence used to push through the train station project in Stuttgart (police using water canon against children, and blinding a man); in Notre Dames des Landes (massive, violent evictions from farm land and house burning); and in a very emotional moment, the whole of the meeting stood in a minute’s silence, to mark the anniversary of the death of an activist Remi Fraisse, a young botanist of 21 killed by a military grenade on 26th October 2014 when he was protesting against the building of the Sivens dam – a project that has now been cancelled. This is what is behind the statement that HSR is being implemented by criminalising the opposition and by militarising the development process. The echoes of fascism are not far away, and the European Commission has to take responsibility for this as it is their plans that are being forced through in this way whilst they make no comment. The PP Tribunal also took evidence on ‘soft violence’ based on fabricating the case for developments (‘lies’ to you and me) and ignoring the voice of consultations in cases such as HS2, in which 90% saying ‘no’ meant the State felt they had the go-ahead. 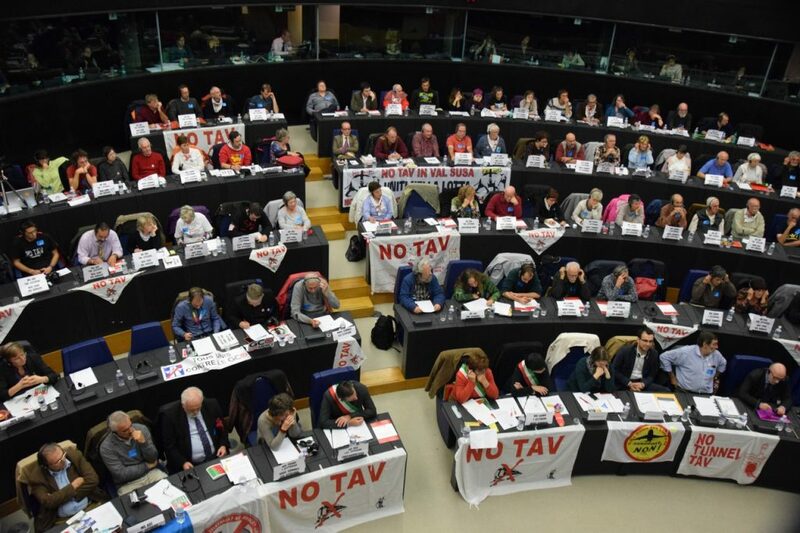 Another example of ‘soft violence’ was given by Tania Gonzalez, a MEP from Spain who said that by spending on these useless projects, the State was ‘stealing’ money from desperately needed projects and putting a bigger and bigger tax burden on poorer and poorer people. She gave several examples where “they continue to tell us that we need more and larger infrastructures even though Spain is full of unused highways and airports without planes“. There was an interesting discussion on Brexit – the general statement being that the EU is in deep trouble on many fronts and they know it, and that Brexit may have pointed this up but is not responsible for it. As one activist said, “It is the Commission’s dominance that is responsible for the ruin of Europe”. Several people said that one way to start to heal the crisis of the EU would be to call a halt to these many totally stupid mega projects right across the EU and to meaningfully engage with citizens around developmental issues. Citizens might finally start to feel that the EU works for, not against them. Another interesting discussion was more of a challenge to the MEPs belonging to the GUE/NLG grouping, who hosted the meeting. These MEPs stressed that they are a small group without much power. The response from the activists was to say that this statement is used as a constant refrain to do nothing effective. Instead of focusing on themselves, they should focus on the mega projects and organise opposition to them right across many MEP groupings. 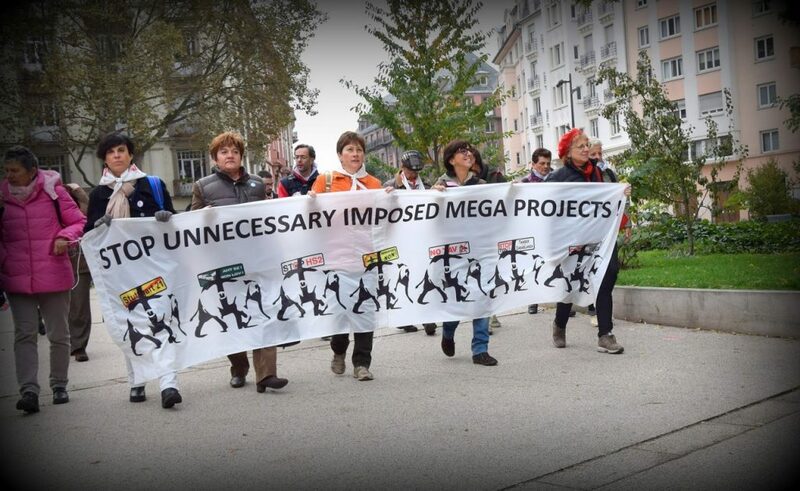 As was pointed out, mega projects such as HS2 make little sense to people right across the political spectrum – and if you get them all in an alliance against mega projects, instead of against each other, you will have plenty of power to stop the procession of white elephants. So now the European Commission has received the judgement of the PP Tribunal. Mr Schultz, as Chairman of the European Parliament can no longer say that he did know about the human rights abuses being carried out under his jurisdiction. We’ll see what he says.